Ruric Thar's Guide to Punching Mages in the Face! 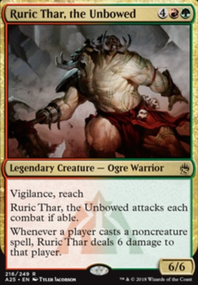 Those of you who know me, or have been following and checking out my decks, you may already know that Ruric Thar, the Unbowed is my favourite creature. As such, I felt it was only appropriate for him to have his own EDH deck! And why shouldn't he? 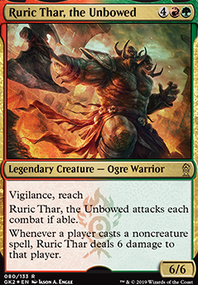 Ruric Thar is an excellent general for punishing control decks; and, the extra damage from his ability, combined with an aggressive start, will often be enough to steal a victory in a format that is heavily biased against aggro decks. That being said, going all in on creature spells would put this deck in "gimmick" territory, making it hard to find solutions for different scenarios. But we can stay true to our anti-spell edict by running only the bare necessities when it comes to noncreatures and devoting the vast majority of our slots to dudes. Since we are going to be so heavily committed to creatures, we want to run as many as possible that can control the board, get rid of problematic permanents that would stand in the way of our beatdown, and we're going to need a few ramp creatures to take the place of green's traditional ramp spells. Acidic Slime - Poster boy for value creatures. Kills what ails you and provides a body that nobody wants to get close to. Arashi, the Sky Asunder - Effective removal of threats in the air. Most notably, the Channel ability does not trigger Ruric Thar; therefore its essentially like casting a sell without the downside. Balefire Dragon - Creature control is very important in this deck, and this guy certainly fills that niche. Bane of Progress - Since the majority of our slots are devoted to dudes, more often than not this will hurt our opponents more than it'll hurt us. Brutalizer Exarch - One of the best creatures in this deck. He can either grab exactly what you need from out of the deck's creature toolbox, or he can get rid of a noncreature permanent in the way of your beatdown. Duplicant - Effective creature-based removal. Gets rid of any utility creatures that are giving you trouble or kills any creature that is bigger than yours, becoming a fatty in the process. Gruul Ragebeast - Given the size of our creatures, this ability is almost always going to work in our favour. Inferno Titan - Removal on a big body. Jiwari, the Earth Aflame - Like Arashi, except it kills chump blockers on the ground. Manglehorn - Destroys an artifact and slows down our opponents. Whats not to like? Nullstone Gargoyle - We want cards that can really screw with our opponents so that it makes it harder for them to deal with our Ruric Thar and our attacking creatures. In order to get to Ruric Thar, they'll have to go through this guy first. Prowling Serpopard - A cheap way to protect our investment from all the blue decks that are rampant in EDH. Reclamation Sage - A naturalize on a cheap body. Spellbreaker Behemoth - See Prowling Serpopard. Terastodon - This deck will target its own lands with the Don more often than most. Especially sweet alongside Gruul Ragebeast. Ulvenwald Tracker - Like the ragebeast, the tracker will rarely get us into a fight we cannot win. Woodfall Primus - Big, gets value, and survives a sweeper. Goreclaw, Terror of Qal Sisma - Accelerates us into playing our big creatures early AND gives Trample when we attack. What’s not to like? Eternal Witness - Creature based decks generally have trouble with sweepers, so any and all recursion is at a premium. Especially when it comes stapled to a creature. Fauna Shaman - One of the best cards in the deck by searching our deck for an answer to any problem on the board. Greenwarden of Murasa - Incredible value. If your opponent manages to kill all your dudes, this guy makes rebuilding your board position much easier. Kiki-Jiki, Mirror Breaker - The best mono-red creature in Commander. There are several creatures in this deck that combine well with Kiki-Jiki; and he's just an all around great card. Beast Whisperer - Nice card draw that works with half of the deck. Soul of the Harvest - Pretty nice creature that has the potential to draws us a lot of cards; and doubles as a trampling beat stick. Vizier of the Menagerie - Allows us to filter the top of the deck and plan ahead. Not to mention the obvious mana-fixing. Birds of Paradise - Classic mana-dork to ramp us up a turn with any colour. Gyre Sage - Great ramp attached to a creature who only continues to get bigger, so it has relevance both early and late game. Karametra's Acolyte - Not a bad ramp card, offers a bit of defense and can accelerate the ramp the more the creatures that are on the battlefield. Oracle of Mul Daya - Fantastic multi land-drop effect that helps filter the top of the deck. Combined with the Vizier they can be a devastating combo where you don't even need a hand to play spells. Grand Warlord Radha - The more creatures we have the more she triggers. Nikya of the Old Ways - A fantastic, and relatively cheap, mana doubler with a downside that we really don’t mind paying with. Selvala, Heart of the Wilds - One of the best ramp creatures in the deck. She drops early, generate card advantage, and has relevance later game by dropping big creatures to destroy opponents. Shaman of Forgotten Ways - Comes with the neat benefit of altering our opponents life total. Can really be a game ender. Solemn Simulacrum - He ramps when he enters, and draws is cards when he leaves. Combines well with Kiki-Jiki. Somberwald Sage - Unfortunately, it doesn't add mana for noncreatures. But for the other 50 cards in the deck it accelerates us from turn 3 to turn 7. Wood Elves - Worth noting that it can fetch duel lands such as Stomping Ground , Cinder Glade , and Sheltered Thicket . Anger - We are an aggro deck, and haste is very important for us. Getting anger in the graveyard can be a little tricky if you don't draw Fauna Shaman; but, at the very least he's a blocker that nobody wants to block into. Kazuul, Tyrant of the Cliffs - More of an aggro deterrent than an aggro enabler; however, the tokens generated from his effect can be more than enough to swarm an opponent. Molten Primordial - Most of an Insurrection, with a 6/4 haste attached. One of the best threats in a dedicated aggro deck, as casting it usually entails a surprise kill. Ogre Battledriver - Give all our creatures some much needed haste and a beautiful boost to their attack. Pathbreaker Ibex - This guy is exactly what we need. He is essentially an Overwhelming Stampede that can pump our army for the kill. Stonehoof Chieftain - Makes our attackers indestructible and gives them trample, most notably Ruric thar, allwoing us to steamroll over tokens without fear of our creatures getting ganked. Urabrask the Hidden - Gives your guys haste, makes it hard for your opponents to block, comes down right before Ruric Thar on the curve. Vigor - Vigor is in here to protect Ruric Thar from killing himself from constant battle. Since Ruric Thar has to attack each turn, naturally something is going to end up blocking him, be it a chump blocker or something bigger than he is. Vigor protects Ruric from combat damage (and maybe the occasional burn spell) and he'll come back bigger and badder than before. Xenagos, God of Revels - Very tough to get rid of, gives our creatures haste, and pumps them to insane levels. Everything this deck needs. Zealous Conscripts - Can bring about a surprise win and creates an infinite combo with Kiki-Jiki. Asceticism - Protects your creatures (especially our constantly attacking Ruric Thar) from both spot removal and sweepers. A must for green creature-based decks. Basilisk Collar - Its in here because its cheap and turns our creatures deadly. But more importantly, when you attach it to our Ruric Thar he attains the Lifelink ability. Which, if you are unfimiliar with Lifelink's wording, states that when the CREATURE does damage you gain life equal to the damage that creature dealt. 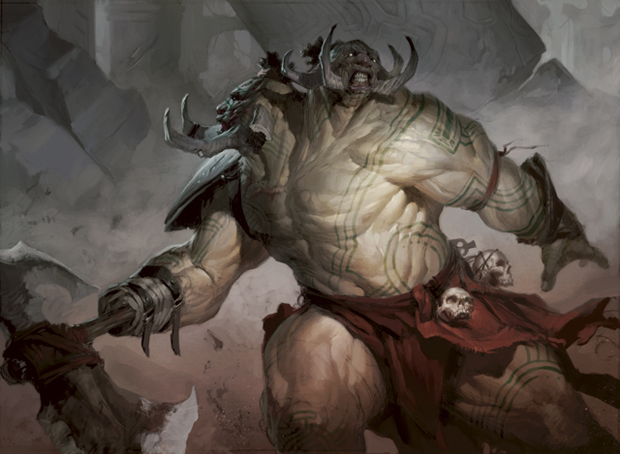 Ruric Thar's ability states that "whenever a player casts a noncreature spell, RURIC THAR deals 6 damage to that player." We essentially just created a way for us to cast our noncreature spells for free AND create an effective way to gain some much needed life. Also combines insanely well with Balefire Dragon . Darksteel Plate - The longer Ruric Thar remains on the board, the more likely you are to win. To that end, we're running Plate as a way to give him some extra staying power. Gratuitous Violence - When you combine this with Ruric Thar, the Unbowed you are a lethal threat to everyone else on the board. Play at you your own risk. Growing Rites of Itlimoc - Digs through our library to find us a creature and generates some INSANE ramp when it transforms. All for the price of 3 mana. Gruul Signet - Simple. Cheap. And effective. Lifecrafter's Bestiary - A free scry at the beginning of each turn is definitely welcome, and generates some great card advantage. Lightning Greaves - The ever-so-useful greaves are back. Throw them on Ruric Thar to ensure he's always protected from spot removal. Loxodon Warhammer - Gives our Ruric Thar Lifelink and Trample, all of which are welcome. Lurking Predators - Pretty necessary in any deck with as many creatures as ours, as every spell cast by an opponent has a 49% chance of getting us value. One thing to note: when playing with Lurking Predators, whenever you reveal a noncreature spell, ship it to the bottom no matter what. If you can't commit to shipping noncreatures 100% of the time, don't put Lurking Predators in your deck. Possibility Storm - This card is yet another card that combines beautifully with Ruric Thar to further hamstring our opponents. With this on the field they can't play what they want right away and may end up with nothing; not to mention they'll take damage from Ruric for casting the first card AND the second card should they choose to cast it. Now of course this applies to us as well but it'll hurt our opponents A LOT more than it'll hurt us. Primal Surge - other than this card, all of our spells are permanents. When we play this card we’re putting our entire deck onto the field at once. If we manage to successfully pull it off then it’s essentially an “I win” button. But you better make sure you’re able to win the game at that point cause once you play this card you’ll lose on your next turn from not having cards in your library. I usually use this as a last ditch effort if things are looking bad for me. Rhythm of the Wild - A fantastic enchantment that protects our creatures from getting countered; and enables aggro by either beefing up our creatures or giving them haste. All things we like doing. Sol Ring - Accelerates our game nicely to lay the smack-down early. Since Ruric Thar punishes us for having noncreature spells, we have to find a way to defend ourselves and/or be able to cast spell-like abilities without the source of the effect coming from a noncreature spell. So our choices of land have to be particularly important in this deck since we'll be relying on them to take care of some of the things that normally come form noncreature spells. Blighted Woodland - Nice ramp attached to a land, ensuring that we are never without enough mana. Ghost Quarter - By sacrificing it, we can get rid of any special land that would be a threat to us or creating a huge boon to our enemies; a lot of times its both. Homeward Path - A perfect example of what we're trying to do here. Your going to see a lot of mind control effects in this format, so having a way to counter it essential in this deck since most of the slots in this deck are creatures. And since this one comes in the form of a land we won't take damage form Ruric. Kessig Wolf Run - Since we need to limit our non-creature spells as best we can this card acts as our "overrun" effect. Mosswort Bridge and Spinerock Knoll - Anything that allows us to cheat in cards is more than welcome. Myriad Landscape - See Blighted Woodland. Nykthos, Shrine to Nyx - An excellent mana accelerator. Tougher to pull off in a deck with more than one Color but having only a 2 Color deck isn’t so bad. Rogue's Passage - Sometimes, we're gonna be up against either a REALLY big creature, or a REALLY big army. But Ruric Thar still HAS to attack each turn. This card allows us safe passage behind enemy lines. Temple of the False God - Nice accelerator. So there it is! I hope you enjoy playing it as much as I enjoyed making it for you. If you have any advice then let me know in the comments section below and, as always, please +1 the deck if you liked it :) Cheers! Ruric 13;Thar's 13;Guide 13;to 13;Punching 13;Mages 13;in 13;the 13;Face!